One thing that life with K has taught me is that I have to be organized…to some extent. My default nature is to procrastinate until the last minute and then make a mad dash to the finish line, but you just can’t live like that with a K around! It takes planning. So over the years, we have become a much more organized family. Since it is the start of a new year and people tend to like to implement new organizational strategies right around now, I thought I would share a few easy things that work well for us. This is the first stop for all appointments or hypothetical plans. I also keep notes here about when things like payments for field trips or activities are due. It cost $0, because I used the free printable found here. Yay, cheap and easy! I keep all 12 months stacked up on my desk so I can easily place appointments as they are made, regardless of how far in the future. In years past, I’ve used a regular planner, but I realized I was only using the monthly pages and not the weekly/daily sections, so it was a big waste! 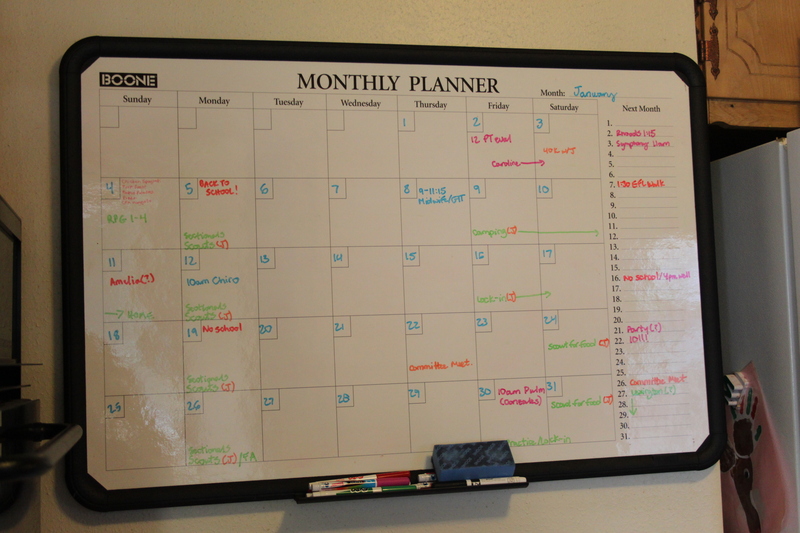 On the first day of the month, I take my desk calendar for that month and the following month and copy them down onto the huge dry erase calendar in the kitchen. Current month goes on the main calendar and the following month goes on the sidebar. Everyone has an assigned color for their activities/appointments, so we don’t have to waste space with names next to everything. As new things pop up during the month, they go on both the desk calendar and the kitchen calendar. Ideally, it means that anyone can go look at the calendar and know when we are free or busy (but in reality, they usually still ask me first instead of looking…it is a work in progress!). Until recently, I was keeping my virtual calendar in Google Calendars and it was working fine, but I decided to give Cozi (also free) a try and was glad I did. Though Google Calendars are shareable, but we never found that it was a good solution for us, so the virtual calendar was really just for me. 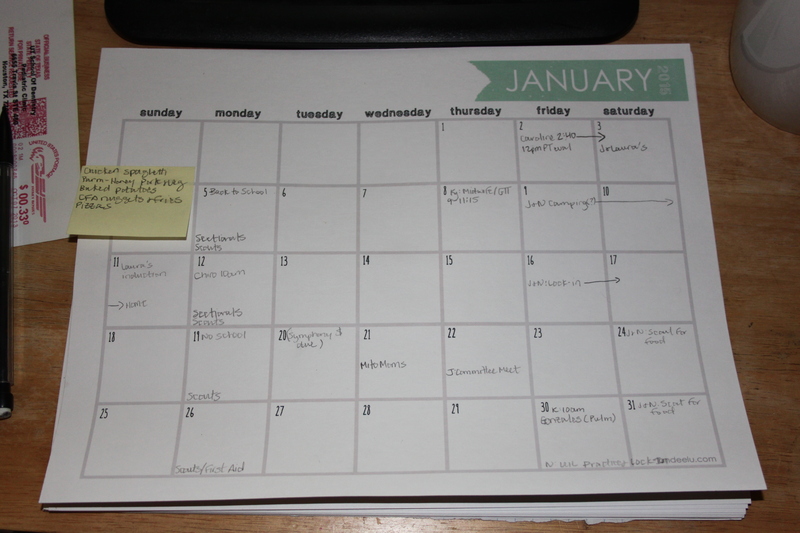 I can set up the calendar in Cozi much like the kitchen calendar (with assigned colors and all), which I really like. 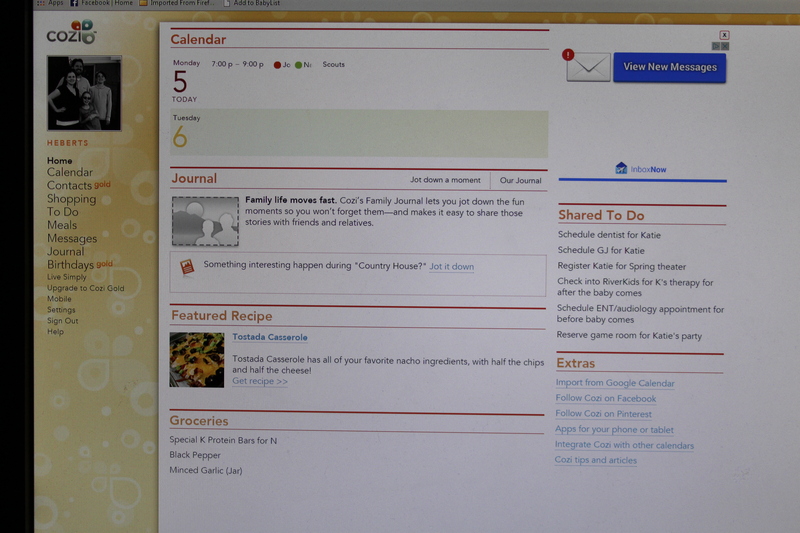 There was some of this customization available with Google Calendars, but only in desktop mode. Unfortunately, on my phone everything was a single color. So now, if I’m at the clinic making a follow up visit for K, I can make that appointment under her color right from the app. Yay! I like to know who is doing what at a glance. At the beginning of the month, I check to make sure everything from the desk calendar has made it onto the virtual calendar (and vice versa, since I do make some appointments on the go). Since switching to Cozi, Josh looks at it more often (and much more easily) which is great, but I think the best part is the shared grocery lists in the app. As soon as we notice we are out of something (or are almost out of something), one of us just adds it to the list in Cozi. No more “What did you say were were out of the other day?” “I can’t remember!” and then we get home from the store and realize we are missing milk or toilet paper or some other much needed thing. It is great! The other very handy thing is that if one of us is at the store, the other can add things to the list while he/she is shopping…like “Ice cream for your pregnant wife”, if the need suddenly arises! Not that this exact thing has happened recently. Nope! 😉 Incessant text messages during store trips have been dramatically reduced. I also really like that there is a desktop control panel, as well as apps for iOS and Android and they all have the same functionality, since we are mixed bunch as far as electronics go. There is also a To Do List, which has been helping me keep track of mostly K-related things like upcoming specialist appointments and procedures that need to be taken care of (especially those that need to happen before the baby arrives), or for making notes about refilling prescriptions and such. For a free app, it has been super helpful! So there are three easy ways we stay organized with everyone going different directions (and a K to keep track of) that almost anyone can use and benefit from…and they are mostly free! If I’m feeling super crazy, maybe I’ll come back another day and go over some of the more K-specific organizational tools I use for managing medical stuff and homeschool life.